The “heart” of any TV tuner card is naturally the TV tuner itself. Its “brain” is the processor that decodes the video and audio signal received through the antenna cable into images that can be displayed on the PC monitor. The quality of the decoder chip is therefore an important factor for the visual quality of a TV tuner card. In case of Compro’s VideoMate, an additional FM Tuner is added. In this case, both components are from Phillips: the Philips SAA7133 chipset is the core processor handling the audio and video signals for TV reception, while the Philips FM1236 chipset is providing FM reception. 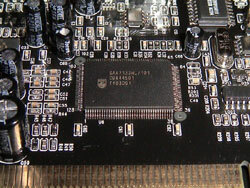 The VideoMate PCB is slightly bigger than the Asus 880 TV Tuner card because it has to accommodate the additional FM Tuner and the connectors for the internal audio and power-up cables. “ComproPVR” is the software for TV watching and recording. Picture purifier: remove video noise and ghost from both original signals and MPEG encoding processing. “ComproFM” and Compro DVD are rather frugal applications. The first one provides FM program listening and recording capability. 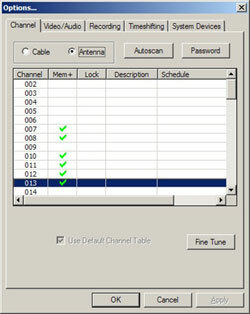 It allows to capture audio and encode it onto WAV, WMA or MP3 formats. ComproDVD provides DVD playback, still image capture and book-marking. 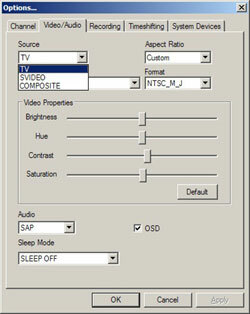 With “Ulead DVD MovieFactory” the user can capture video directly from camcorder to DVD or CD, edit +RW and -RW DVDs, burn videos onto CDs or DVDs and play on TV or computers, and create CD labels and case covers. “Ulead VideoStudio 7” is a well-known video capturing and editing software. Both Ulead applications are stripped down “special editions” with less content than the full retail versions.